The Western Conference is in an arms race—and the Houston Rockets are losing. They may regret it later, but they were smart to re-sign Chris Paul. But they have since seen Trevor Ariza and Luc Mbah a Moute move on to new teams. With how several teams in the conference—including the Warriors – have added talent, Houston may need to address those losses. It sounds like they may be trying to do just that by acquiring Carmelo Anthony. But there is another player they should be a little more concerned about—Clint Capela. Centers aren’t appreciated as much as they once were. 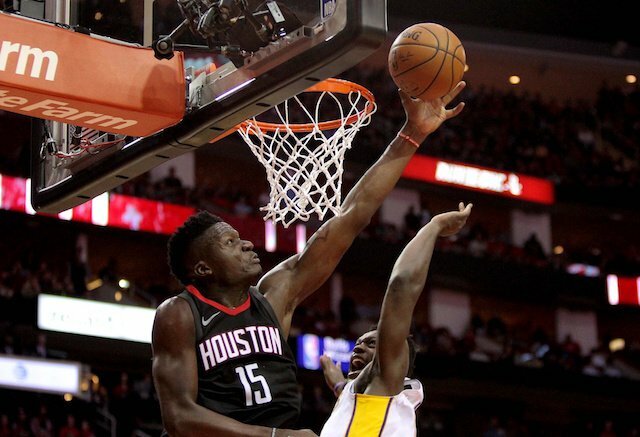 But Capela was certainly an important part of the team’s success last season. Houston seldom lost a game when James Harden, Chris Paul, and Capela were in the starting lineup for. He certainly worked well with the team’s two superstars. With their free agent losses, it could be said that they don’t just want him back; they need him back. Since he is just a restricted free agent, they will get him back. They’ll either match whatever offer someone else makes, he’ll agree to a deal, or he’ll sign the qualifying offer putting him under contract for next season with Houston. Of course, if he decides to gamble on himself and take the qualifying offer, next season will likely be his last with the Rockets. After he proves that last season was not a fluke, someone will pay him more than the Rockets are willing to now. But with as well as he played with James Harden and Chris Paul last season, the team needs to bring him back into the fold. They should certainly be much more concerned about that than acquiring Carmelo Anthony. Yes, at one time, Anthony was a great player—but it has been awhile since that has been the case. To be fair, it is hard to look like a good player when you play for a team as bad as the Knicks have been. But he was with Russell Westbrook, Paul George, and the Thunder last season. Instead of proving that he still has game, he whined about coming off the bench and playing a reduced role. He failed to realize, of course, that he wasn’t playing like a guy who deserved starters minutes. His behavior last season should be a red flag. But then there’s his past relationship with Rockets head coach Mike D’Antoni. Anthony had issues with D’Antoni when he coached the Knicks. If he had issues with D’Antoni and his style then, it is not hard to imagine he’ll have issues with him again. Carmelo Anthony could end up generating more discord and angst within the team than he does points on the court. Is the Rockets front office sure it wants that in its locker room? Houston needs to reconsider how hard the team wants to pursue Anthony. They also need to apologize for the ridiculous four years, $60-70 million offer they made Capela. That’s more in line with what average centers get—and he’s not average. Is he worth the four-year, $100 million contract he wants? Eh—maybe. He rejected Houston’s five-years for $85 million ($90 million with incentives). Since he hasn’t really generated a lot of interest in the free agent market he’ll realize that $17 million a season is pretty darn good. It’s not $25 million a season, but it is still pretty darn good.